Game recap April 9: Is this too good to be true? After the New York Mets defeated the Miami Marlins 4-2 Monday night, a tweet by The Ringer’s Sean Fennessey caught my eye and summed up exactly how I was feeling. Is all of this too good to be true? Last night’s victory means that this current incarnation of the Amazins’ has matched the best start in club history; the Mets also started 8-1 in 1985 and 2006. 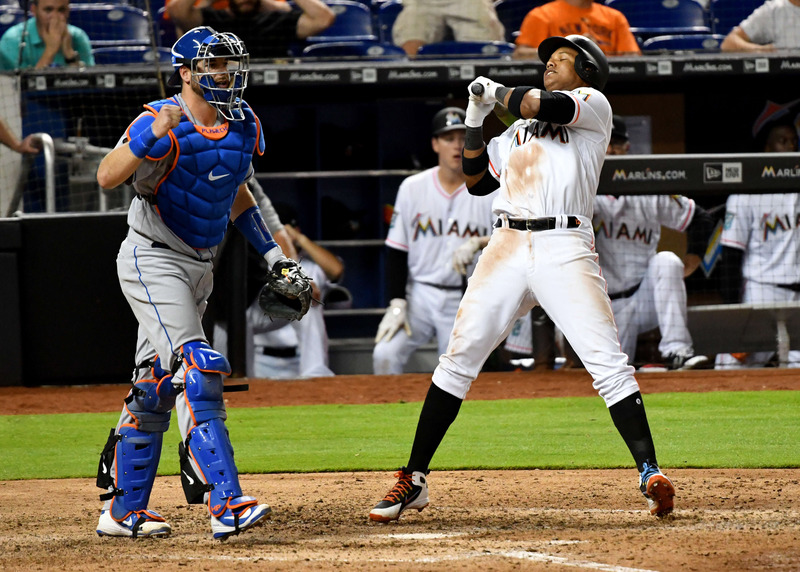 After the 12-inning contest in Washington Sunday, the Mets’ travel plans resulted in arriving at their Miami hotel somewhere around 5 a.m. Acknowledging the potential fatigue in play, Mickey Callaway offered his veteran starters the chance to take a day off. All of them declined and ground out an important victory in Miami. A noticeable trend so far in 2018 is that Mets starters haven’t been going very deep into games. It is very early in the season and Mickey Callaway seems to be taking a cautious approach to lengthening his starters’ outings, but sometimes bullpens do tend to get stretched thin pretty quickly. Noah Syndergaard worked through six innings tonight, tossing 90 pitches, 54 of which were strikes. He notched five strikeouts and two walks along with five hits. The Fish scratched across an unearned run in the bottom of the fifth off the bat of Derek Dietrich and then one more the following inning from a Brian Anderson double, but that was all the offense they were able to manufacture against Syndergaard. Thor’s slider seemed to be working exceptionally well tonight until he ran into some trouble with it in the fifth. The Mets’ star right-handed grabbed his second win of 2018 and strung together yet another solid start in the young 2018 campaign. To say the Mets bullpen has been anything short of exceptional in 2018 would be an understatement. Monday’s effort was no departure from the norm. The relief unit combined for three scoreless innings and four strikeouts with four hits and one walk. That line would have probably looked even better if we didn’t have to deal with yet another erratic ninth from Jeurys Familia. Despite raising everyone’s blood pressure just a bit more, Familia recorded his fifth save of the season. We’re obviously seeing the best that this bullpen can be, but it will be interesting to see how they respond when off days are less frequent. The Mets are generally a team that has relied on the long ball as a means to fuel their offense. Last night, they got by without the benefit of a home run and still managed four runs. Adrian Gonzalez opened the scoring by singling home Todd Frazier and the second run of the game came on a Kevin Plawecki double play. Jay Bruce added to the deficit with a beautiful opposite field single in the third to raise it to 3-0. The Mets added one more in the seventh on an Amed Rosario single that scored Gonzalez. Gonzalez had gotten to third on an error by Justin Bour which should have been a routine 3-4-3 double play. It’s encouraging to see contributions coming from all areas of the lineup. Gonzalez has been a revelation and Bruce has been hot since he launched that grand slam in Washington on Thursday. Rosario has operated nicely in the nine hole and Michael Conforto looks like his old self, notching another base knock today. The only real cause for concern (other than behind the plate) is the slump Yoenis Cespedes seems to find himself in. It was reported that the Cuban slugger has been battling flu-like symptoms, but the good news is that it hasn’t impacted his defense at all. Cespedes came up with an outfield assist Monday on a Braxton Lee single where he tried to take second on a hustle play. The key cog in the Mets lineup is on a 1-17 skid, but it’s important to note that the one hit was a game-winning single. Hopefully, he comes out of it quickly. Watching Mets catchers try to throw out runners has just been painful. Starlin Castro pumped up his stats by taking advantage of Syndergaard’s slow move to the plate and Plawecki’s poor defense. What makes matters worse is that the Travis d’Arnaud/Plawecki platoon isn’t doing much hitting either. Through the first two games, they were 3-6 with three walks and a home run. Since then, they are 3-25 with two walks and a hit by pitch. The good news is that with the production this team is seeing from the rest of their lineup, the catchers can get by on a slump for now. But sooner or later they will have to start producing. And if they can’t, then it’s time to seek an upgrade elsewhere. The Mets are back at it tonight in Miami where Jacob deGrom faces Marlins lefthander Caleb Smith at 7:10 p.m.